Concerning War is a project with a multi-faceted format including an exhibition, a series of conversations, lectures, and workshops, as well as a publication that consider how the issue of war is reflected upon in contemporary artistic practice. The exhibition entitled Soft Target. War as daily, first-hand Reality poses the question as to whether art can provide a probing, radical impression of war as a daily, first-hand reality. Can art represent war? Susan Sontag argues, “We can’t imagine how dreadful, how terrifying war is and how normal it becomes.” And what about art? Can artists imagine, contrary to Sontag’s suggestion, that zone in-between the “terrifying” and the “normal” where representation (as in the mass media) falls short? Can critical artistic practice convey the very experience of war? 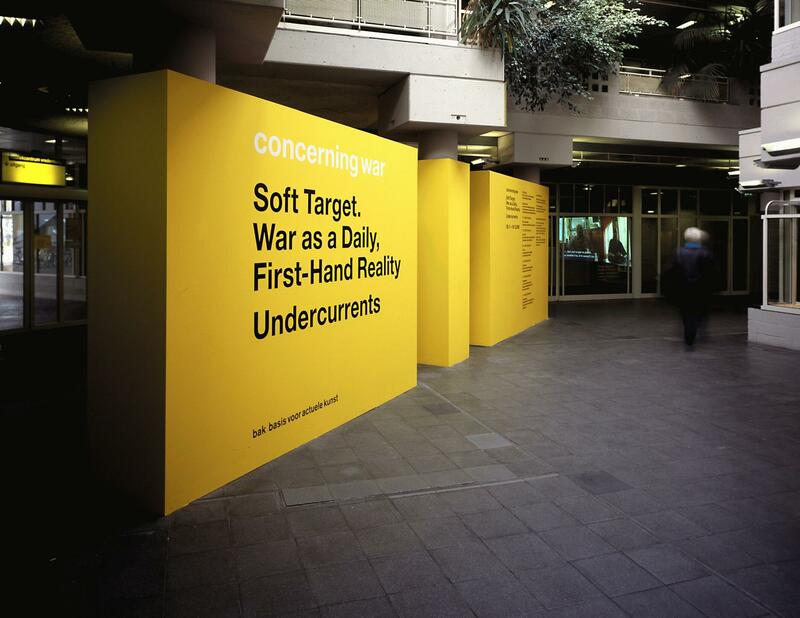 Undercurrents, a series of discursive and performative activities in the context of Concerning War, takes this as a starting point and extends the question further: What position do artists and intellectuals today take toward the subject of war in their work? A number of artists, art theorists, and other cultural professionals are invited to develop a series of theoretical undertakings around these issues and look at the ways the concept of war has been transformed in reaction to complex contemporary conditions mainly in relation to terrorism. The invited participants present the outcome of their research and work in a dynamic, informal forum for reflection about what is behind this new state of warfare. Kamal Aljafari, Maja Bajevic, Jean-Jacques Birgé, Manel Esparbé i Gasca, Jean-Luc Godard, Sagi Groner, Afredo Jaar, Aryan Kaganof, Chris Marker, Renzo Martens, Aernout Mik, Deimantas Narkevicius, Jules & Gédéon Naudet, James Hanlon, Ronald Ophuis, Adela Peeva, Alain Resnais, Anri Sala, Coco Schrijber, Peter Watkins, and Jasmila Žbanic. Curated by Brigitte van der Sande. Ayreen Anastas, Mieke Bal, Boris Buden, Pavel Buchler, Bregje van Eekelen, Rene Gabri, Kendell Geers, Klub Zwei, Hito Steyerl, Jeremiah Day, Lars Bang Larsen, Dieter Lesage, Renzo Martens, Viktor Misiano, Henk Oosterling, Willem de Rooij, Sean Snyder, Jan Verwoert, and Young-Hae Chang Heavy Industries. Curated by Danila Cahen, Binna Choi, and Maria Hlavajova. A panel discussion with Benda Hofmeyr, Lars Bang Larsen, Zoran Terzic and Sagi Groner. Invited guests on the panel present research and projects that closely examine the position and character of critical artistic and intellectual practices, and attempt to rearticulate connections between the aesthetic and the political.